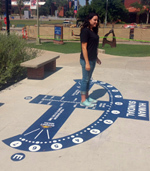 Volunteers painted a 16 x 5 foot analemmatic dial for the elementary and middle school students. The dial has 8-inch circles for hour numbers from 5am to 7pm using standard time. The dial walkway is painted with yellow month lines and abbreviations for each month to the side. The words "summer" and "winter" are at the solstice lines. Bailey points are painted as small yellow circles to indicate the direction of sunrise and sunset from the observer's position on the walkway. 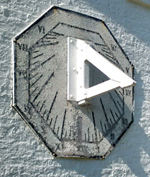 This large horizontal dial has a gnomon in the shape of an anchor and concrete minimalist dial surface in the shape of a triangle, keeping the theme of the location "Triangle Park". Three time Arabic hour numbers of 9, 12 and 3 are embedded into the concrete slab and two other time marks of 6am and 6pm are on separate pads located outside the main dial area. 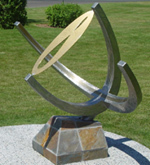 This large vertical south facing sundial is fabricated from aluminum. Eight slender hour lines delineate the time. At the top of the hour lines along the winter solstice are acrylic numbers on the circular hour plates showing time from 10am to 5pm. 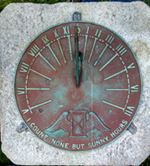 At the bottom of the hour lines along the summer solstice are additional acrylic numbers showing daylight saving time from 11am to 6pm. A short horizontal bar shows the equinox. This monumental horizontal dial is 15 ft. in diameter sitting on a foundation of poured concrete and rebar. The dial face is etched on 4 large granite slabs from Canada. The gnomon is a 6-inch diameter steel pipe 97inches tall with a welded nodus ball and a triangular sheet beneath the gnomon that has a sun and the school logo (a mountain range) cut into it casting projected images onto the sundial face. This beautiful stainless steel equatorial is approximately 1m in diameter with brass inlay for the equatorial time, divided down to the minute. 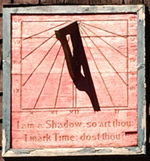 This is also an analemmic sundial where the brass gnomon is cut out in the shape of an analemma allowing the user to directly correct for the equation of time. The analemma is marked with 365 individual date marks. In the Cranbrook Gardens, where works of art topiary and American crafts are displayed, one can find a brass horizontal dial transformed into a beautiful sculpture of a swan with the tail serving as the style, and the hour lines are the feathers of the wings. A small circle with Arabic numbers delineates the hours. 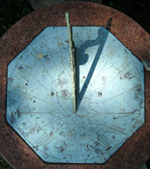 A horizontal sundial made on an octagonal brass plate, measuring 12 inches from side to side. The engraved hour lines are divided with marks for half, quarter and eighth parts of the hour. The hour numbers themselves are outward facing Roman numerals. The brass gnomon is bent slightly to the west by vandals. The pedestal is 37.5 inches tall with a 17 inch circular top cap of pink marble. Unfortunately the dial is located near a tree, so it is in shade for part of day. A simple analemmatic dial about 12 feet across. Square unmarked flagstone or pavers mark the hours. The walkway has a concrete base covered by the same flagstone or pavers. The walkway months are embossed in the stone. This analemmatic dial (sometimes called a human sundial) is designed for children. 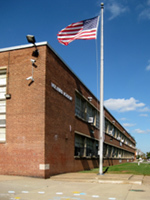 Approximately 16 ft wide, it is constructed of red brick with steel hour marks. The numbers for standard time are large silver and the numbers for daylight saving time are smaller and black. A black steel walkway is located in the center of the dial with embossed months of the year. Children stand on the month. Their shadow marks the time. Large numbers are standard time. Small numbers are daylight saving time. 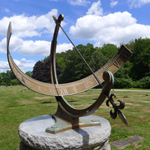 Prominent in the cemetery is a large equatorial sundial about 4 ft in diameter. The dial was custom built for the location latitude and longitude. It is made of cast, anodized aluminum. The equatorial ring is 8-inch side arc with Roman numeral hours from VI to VI (6am to 6pm) with marks at 5 minute intervals. The scale is shifted to correct for longitude. The gnomon is an elegant arrow. It sits on a 4 ft plinth made of river stone, capped with a circular 6 inch block of polished granite. In the shade of many trees is a 12 inch circular horizontal sundial sitting on a square granite plinth. The dial plate shows solar time with Roman numerals V to VII (5am to 7pm). Half and quarter hours are shown with dots. 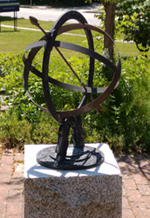 This bronze armillary sundial is about 18 inches in diameter. The prime meridian ring is embossed with an intricate design. A different designed with forward and backward "S" adorns the exterior of the equatorial ring while the interior has embossed Roman numerals for the the hours. The 6-hour ring is plain and there is no horizontal ring. The arrow gnomon rod is at the correct slope but the dial is free to turn on its base so that it is not oriented north. The sundial is a 10-inch circular bronze horizontal dial engraved with hours in Roman numerals from IIII to VIII, (4 am to 8 pm) and marks for the half and quarter hours. A compass rose shows 32 compass points. Unfortunately the gnomon is missing. It was originally fastened by two weak screws. Attempts to solder the gnomon in place failed. 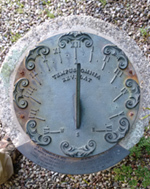 This is a hammered wrought iron equatorial sundial approximately 30 inches in diameter with a 6 inch equatorial band. The gnomon is a thin rod bracketed by an iron slit that is manually rotated to allow a bright beam of light to surround the shadow time-telling mark. The dial is designed to show local solar time, and requires the Equation of Time to correct for the tilted earth’s rotation axis and its eccentric orbit around the sun.